VWO is an all-in-one platform that helps you conduct visitor research, build an optimization roadmap, and run continuous experimentation. Their platform enables you to create a process-driven optimization, get benefits of a connected, unified view of the individual visitor and run A/B tests at scale without reducing performance. The VWO Destination is open-source and you can browse the code on GitHub. This document was last updated on July 26th, 2018. If you notice any gaps, outdated information or simply want to leave some feedback to help us improve our documentation, please let us know! The first step is to make sure Visual Website Optimizer supports the source type and connection mode you’ve chosen to implement. You can learn more about what dictates the connection modes we support here. Search for “Visual Web Optimizer” within the Destinations Catalog and confirm the Source you’d like to connect to. 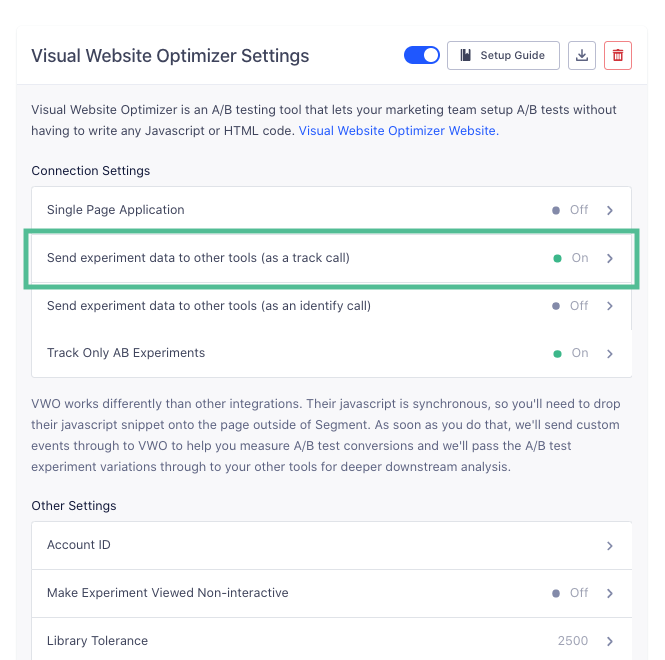 When you enable the VWO destination, we set the option for “Send experiment data to other tools (as a track call)” to true by default and we will automatically collect the Experiment Viewed event as a track call. experimentId String The experiment’s ID. variationName String The variation’s human-readable name. By default, we will take the variation data that is available in VWO and send that data to the other user-tracking destinations you have enabled in Segment automatically. That way, you can segment your analytics reports by the variations a user has seen. For example, if you have an experiment called Home CTA and a visitor sees a variation called Create free account now, we will send the Create free account now value as the variation_name property of the Experiment Viewed event and/or as a trait of the user in an identify call (depending on your delivery settings). If you are using VWO together with Google Analytics, you can enable this setting to add the nonInteraction flag to your Experiment Viewed track events. This can help with low bounce rates. The maximum amount of time (in milliseconds) to wait for VWO’s full library to be downloaded before simply displaying your original page. This setting is only effective if “Use Async Smart Code” is set to “true”. The maximum amount of time (in milliseconds) to wait for test settings before VWO will simply display your original page. This setting is only effective if “Use Async Smart Code” is set to “true”. If your page already includes JQuery, you can set this to “true”. Otherwise, VWO will include JQuery onto the page for you. VWO needs JQuery on the page to function correctly. This setting is only effective if “Use Async Smart Code” is enabled.